Anti-Israel hatefest season kicks off. Last wednesday I went to hear two pro-Hamas supporters give a talk to a group of revolutionary communists at a London pub. The subject of the talk was “Ten years of Intifada – What Future for Palestine?”. I cleared it with the pub manager beforehand so I wasn’t barred as happened to me when I tried to attend a Middle East Monitor meeting at the House of Commons in July. Seems our pubs are more democratic than Parliament. When I entered the room the front table was adorned with a “Victory to the Intifada” banner and the banner next to me read “Boycott Marks and Spencer”. The chairperson opened the meeting by telling us how M&S was closely entwined with the growing of the Zionist project and how past M&S directors had made many racist statements. The two speakers, Ghassan Abu-Sitta, a Palestinian surgeon, and Manal Masalha, a Palestinian activist and PhD student, spent the next hour basically telling us how Fatah/PLO had sold out to the racist imperialists and Zionists. Fatah had, apparently, now conspired in the Zionist project via the Oslo peace accords and will eventually either agree future landswaps with Israel so that Israeli Palestinians will be transferred to a new Palestinian state or there will be an outright ethnic cleansing of Israeli Palestinians. 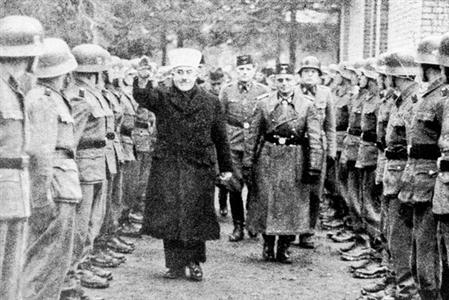 What was needed was a national liberation movement and although Hamas was far from perfect (Abu-Sitta acknowledged that Hamas demolishes Palestinian houses which don’t have permits) it was the only organisation capable of doing what was necessary to free the Palestinian people. During the Q&A a Sri Lankan man asked whether Hamas should be either more democratic in its behaviour or step aside. He compared Hamas to the Tamil Tigers who, he felt, had caused chaos in Sri Lanka and that Sri Lanka was now benefitting from their demise. Abu-Sitta disagreed and told us just how democratic Hamas is and how it had gone along with the Oslo Accords until Fatah had finally sold out the Palestinian cause. I didn’t want to complicate issues by mentioning Hamas suicide bombers walking into Israeli restaurants to blow up families who were at lunch. Abu-Sitta said that is impossible as Zionism is incompatible with peace. 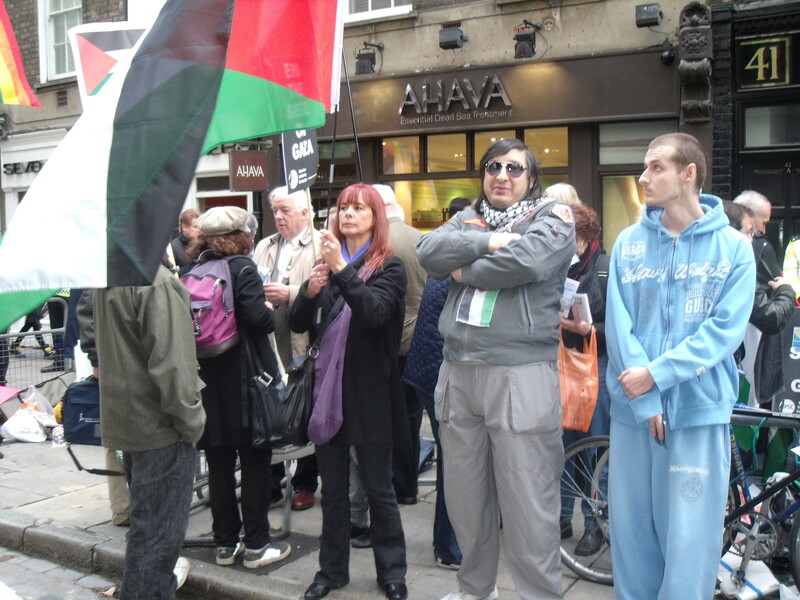 Some of the audience then praised the smashEDO protesters in Brighton and the protesters that constantly harass Ahava but United Against Fascism came in for criticism for their statement on their website that “‘UAF does not have a position on the question of Israel and Palestine’ when it should have”! Ok, so this meeting was above a pub and there were only 20 people there but the statements made are not too disimilar from those made at the many anti-Israel events that take place throughout the year. 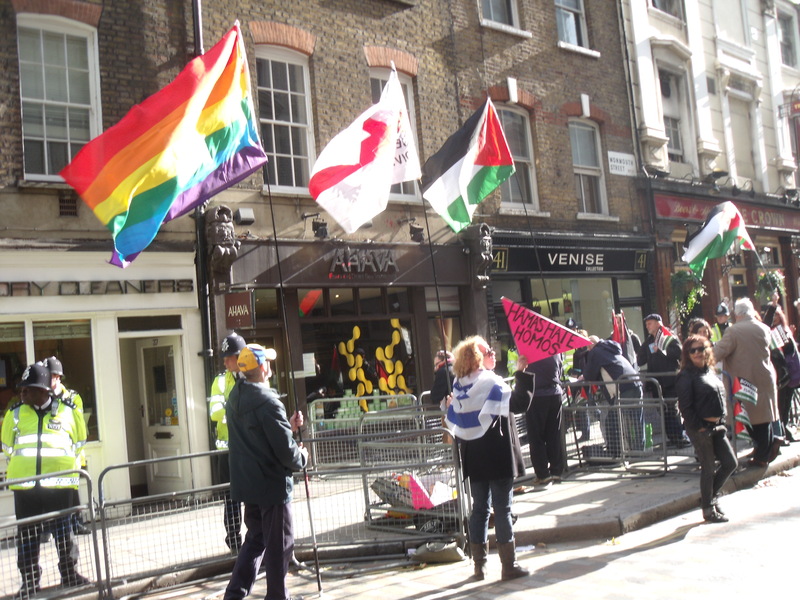 This meeting kicked off the post summer anti-Israel hatefest season with conferences galore already arranged where anti-Israel activists can devote disproportionate amounts of their time to giving a good, hard kicking to the Jewish state. Next up this tuesday is a Palestine Campaign event at the House of Commons entitled Ending the siege on Gaza – Eyewitness reports from the Viva Palestina convoy, Parliamentary delegations, and Westminster University Architects. Then on 20th and 21st November there is a disgraceful two day conference at the Law Society, of all places, entitled International corporate complicity in Israel’s Violations of International Human Rights Law, International Humanitarian Law, and War Crimes. Hilariously, the conference is taking the form of a jury trial. I wonder whether Israel will be acquitted or not. Answers on a postcard please. And on December 1st Middle East Monitor is presenting Professor Richard Falk, United Nations Special Rapporteur for Palestinian Human Rights, who is going to speak on The Israeli assault on human rights in the Occupied Palestinian Territories. All this before Israel Apartheid Week in the new year! There really are few places like the UK it when it comes to the amount of opportunities to express one’s hatred for the Jewish state. These organisations would, no doubt, offer an invitation to President Ahmadinejad if our authorities would only allow him to come to these shores. Welcome to Lebanon; now part of Iran. Imagine your father was murdered and five years later the man that sent his killers pays you a visit. You let him in because you fear the consequences if you don’t. Additionally, you see tens of thousands of this man’s supporters lining the roads and cheering his arrival. This was the tragic fate of Saad Hariri, Lebanon’s Prime Minister, last week when President Ahmadinejad visited Lebanon. As one former Lebanese Sunni MP put it: “This wasn’t a visit to Lebanon but a visit to Hizbollah”. 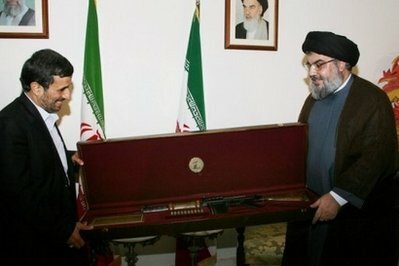 While there Ahmadinejad called Lebanon a “university of jihad” and said that both Iran and Lebanon have much in common, primarily their war with Israel. I am sure that Iran and Lebanon have far more to their national identity than enmity torwards Israel, not that Ahmadinejad makes it appear so when he speaks. But there is no war between Lebanon and Israel. The problem is purely Iran. “Your talk of ‘changing the face of the region starting with Lebanon’ and wiping Israel off the map through the force of the Islamic Resistance in Lebanon gives the impression that your visit is that of a high commander visiting his front line”. 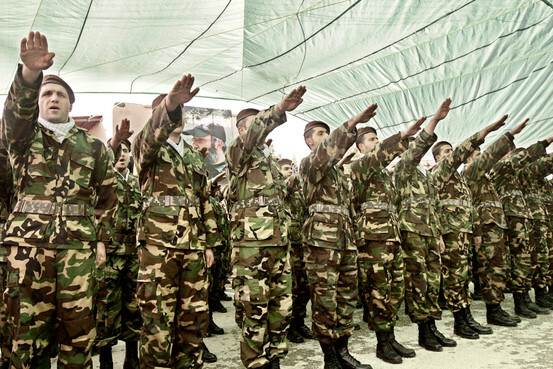 It seems certain that the United Nations is about to hold Hizbollah and Syria responsible for the murder of Lebanon’s then Prime Minister Rafik Hariri in 2005 and issue indictments. Both Hizbollah and Iran have previous including deadly bombings of the Israeli Embassy and a Jewish Community centre in Argentina in 1992 and 1994 respectively. Over 100 dead. Then there were the 1983 deadly truck bombings that destroyed the American Embassy, the headquarters of the US marines and that of the french paratroopers all in Beirut. Nearly 400 dead. It was Hizbollah that in 2006 that started the Second Lebanon war when it ambushed Israeli troops inside Israel killing seven and kidnapping two. The remains of Ehud Goldwasser and Eldad Regev, were later returned in exchange for the freedom of child-killer Samir Kuntar. Even now Hizbollah still controls the whole of southern Lebanon and has 40,000 rockets at its disposal. It has relatively easy access to Israel’s northern border. The UN troops are no match for Hizbollah and would never fire on them anyway. Meanwhile, Ahmadinejad continues to pour millions of pounds of reconstruction aid into southern Lebanon after that war, money that could be spent on the suffering Iranian economy. Building a nuclear bomb drains the economy even more. Not that Ahmadinejad cares much for his own people judging by his treatment of many of them. And it is still a mystery why thousands of Lebanese people would want to line the streets to cheer a deadly and proven misogynist, homophobe and anti-Semite who has helped tear his own country apart. Car bombs are already exploding in Lebanon on the eve of the UN’s report into the murder of Hariri as the scent of civil war is in the air yet again . And Syria has issued arrest warrants against those it accuses of complying with the UN investigation. However much Ahmadinejad paints a picture of harmony between Iran and Lebanon, there is none. Syria and Iran are resuming their old ways and cannot leave Lebanon alone. Controlling Lebanon is the route to war with Israel and so to distract the Iranian people from their own troubles and the world from Iran’s progression towards the bomb. King Hussein of Jordan once had a similar problem. The PLO was fighting to take over Jordan but in 1970 he crushed the Palestinian resistance and expelled the PLO to Lebanon. This time, backed by Iran, Hizbollah is in Lebanon to stay. Meanwhile, another war between Iran and Israel, via Hizbollah, looms but at least four years on the world knows the true nature of Hizbollah’s main backer. 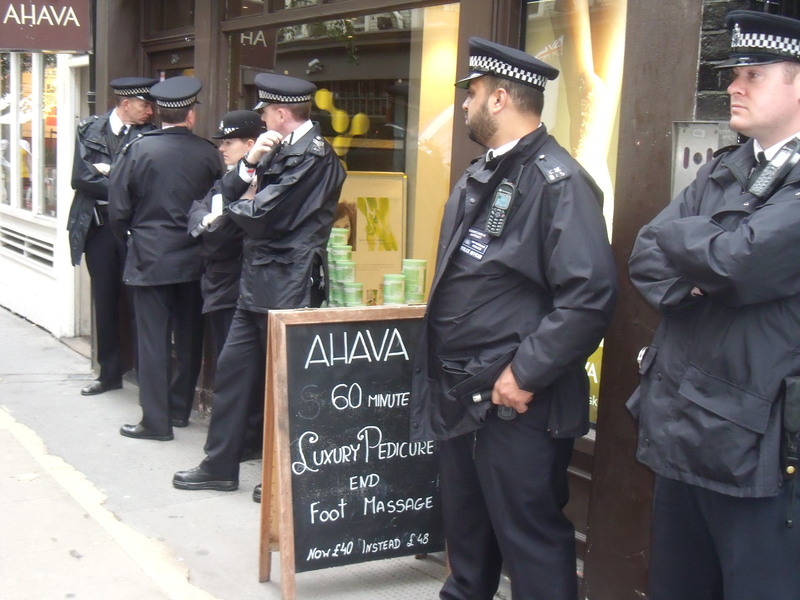 After the previous Saturday’s attack on Ahava’s Covent Garden store the Metropolitan Police upped their presence to guard against further similar disruption during last Saturday’s anti-Israel protest. There were about 25 officers. The anti-Israel activists were there in their usual numbers, about 45, while the pro-Israel counter-demonstators numbered about 15. Despite being outnumbered it wouldn’t be hard to figure out which side was making the more compelling argument to passers-by. Police were not letting anyone into the store without prior approval. As I approached the door two officers menacingly blocked me before looking round at Rita, all of 5 ft tall and alone in the shop, who gave them the nod to allow me in. I wondered whether the heroic men who attacked the shop the previous Saturday would have done the same if there were two burly male members of staff present in the usually unguarded shop instead of just one or two females. I doubt it very much being cowards to the core. Still the leading organising activist told me that such violent action against Ahava will continue until the shop has to shut. He also went on to tell me that Gilad Shalit, the Israel soldier abducted by Hamas four and a half years ago, should be dug up (assuming he is already dead) and killed again because that is what he deserves. Nice, eh? That, if anything, is a reminder of the hateful ideology behind this specific protest for those who think that this is just a legitimate protest against Ahava’s presence on the West Bank. The protest went off smoothly for once, albeit loudly due to Deborah Fink turning up to sing her dreadful Boycott Song to the tune of Hava Nagila for the instant, captive audience that the protest provides her. Don’t forget to come to the Zionist Federation’s Ahava Buycott on 20th and 21st November and get 10% off all goods in time for Chanukah and Christmas and also shop at the other stores on Monmouth Street, which are also under pressure because of the repetitive and disruptive anti-Israel protests. Ahava is at 39, Monmouth Street, Covent Garden (Leicester Square tube). Alternatively, go to www.ahava.com to order online. Gilbert and Sullivan’s hilarious Operetta Trial by Jury, first performed in 1875, mocks the pompous english legal system. It is about Edwin who goes on trial in front of a jury for breaking off his engagement to Angelina. She has sued him from breach of promise of marriage after he went off with another woman. The court usher advises the jury to set aside any “vulgar prejudice” they may have but then tells them to “observe the features of her (Angelina’s) face, the broken hearted bride”. He then refers to Edwin as the “ruffianly defendant”. The jury duly takes an instant dislike to Edwin while Angelina looks sweet wearing her wedding dress. Nevertheless, Edwin agrees to marry both his current lover and Angelina to atone for his sins. The judge thinks this reasonable but when advised of its illegality he offers to marry Angelina himself. His offer is accepted and everyone is happy. The fun of this operetta is that it is so illogical because such bias would obviously never occur in a British court. Or would it? Well, 135 years later it did. In a recent court case seven defendants were put on trial for causing £180,000 of damage when they attacked the EDO arms factory in Brighton during Israel’s war with Hamas in Gaza. They believed the factory supplied Israel. 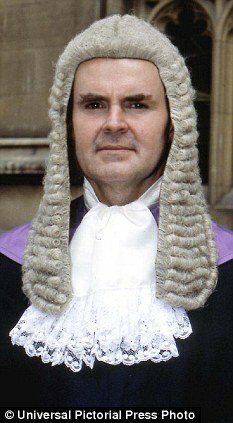 They were acquitted when Judge Bathurst-Norman similarly fell for the charm of the defendants and also compared Israel to the Nazis. Here is the full transcript. War crimes? Says who apart from the ill-informed Goldstone Panel that took evidence from residents of Gaza in open court with all the deadly repercussions that could entail if they told what Hamas didn’t like to hear. Yes, there was dreadful loss of life during the fighting against Hamas but to compare this to the Nazis is crass. And after this horrifically biased direction the judge then has the gall to tell the jury to “put that emotion aside”. Bathurst-Norman would have done better to have saved the huge amounts of pubic time and expense of all the public bodies involved in this case and declared the defendants not guilty right at the beginning of the case. For what it counts, Judge Bathurst-Norman has now been censured for his comments. Although this will have little overall effect on the judge, and no effect on the defendants, it should stop this case being used as a precedent in future cases when other valid businesses have violence used against them. Up until this reprimand there was the prospect of one’s political ideology being used as a successful defence in court. Either you are guilty of aggravated trespass or conspiracy to commit criminal damage or you are not. There is no room for political ideology in a court of law, unless, of course, you are in Iran. But, hopefully, Iran we are not. However, as a modicum of success as this might be, and full credit to Jonathan Hoffman and others who brought this case to the Lord Chancellor’s attention, there will be more legal battles to fight against those who choose to use violence in Britain to achieve political ends. 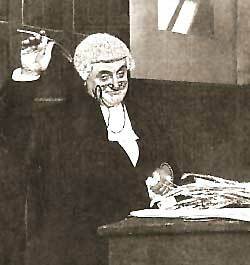 In the meantime we can all enjoy Judge Bathurst-Norman: The Opera. Another attack at Ahava; legislation required. Ahava is all perfectly legal. 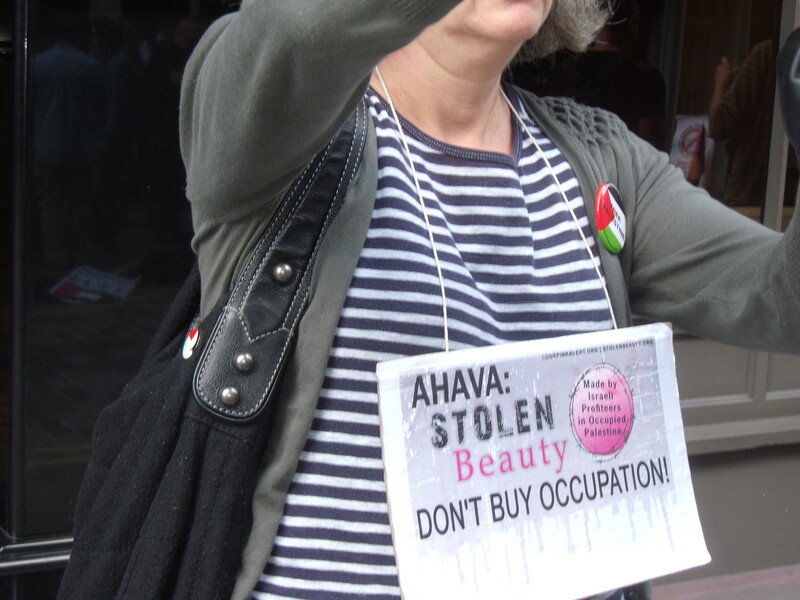 Come to the Buycott on 20 and 21 Nov.
With the incessant physical attacks on the Ahava shop in London’s Covent Garden it is about time that legislation was enacted to deal with the continuous intimidation of staff and disruption to business. 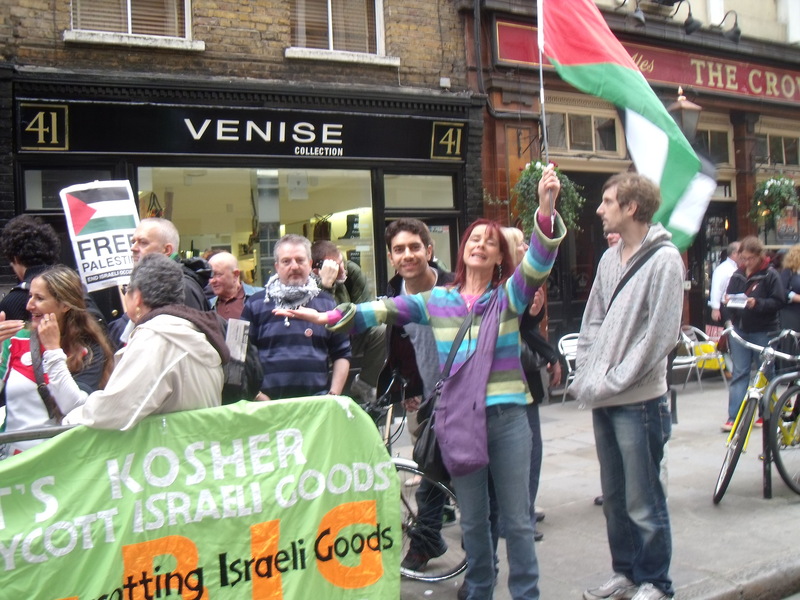 Last saturday anti-Israel activists stormed the shop again. They wheeled in a concrete block and locked themselves on to it before throwing themselves to the floor making it impossible to remove them. The shop was closed for three hours and the police came. The activists were arrested for aggravated trespass. 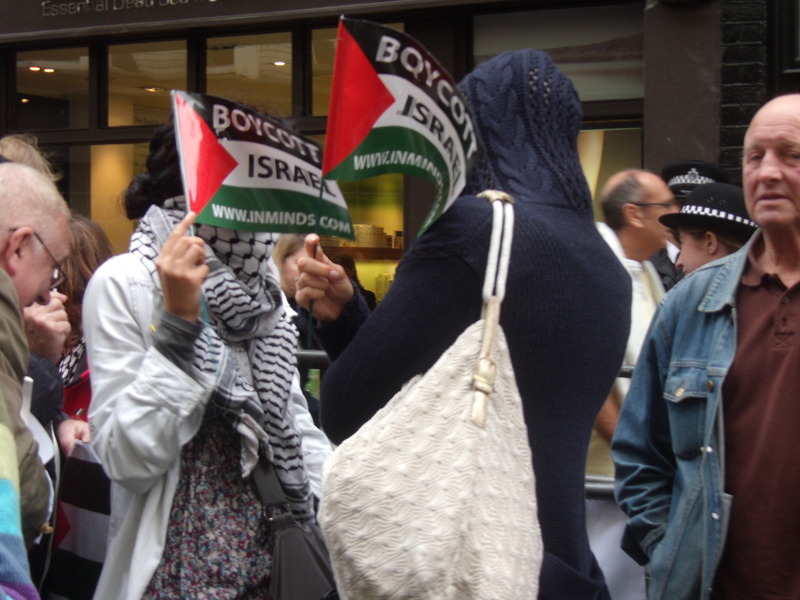 In a recent court case anti-Israel activists were prosecuted for taking similar action towards the end of last year but were acquitted on all counts. The case collapsed because Ahava failed to show up in court. Ahava claim they were given no notice of the case. Others say Ahava chose not to turn up and defend themselves for fear of heavy cross-examination over their product labeling. It seems to be uncontroversial but when you have an ideological hatred towards the Jewish state anything, and everything, will be picked up on. The Ahava factory that makes the products is based on the Dead Sea kibbutz of Mitzpe Shalem. It provides jobs in engineering, chemistry, research, and marketing & sales. There are 120 employees. The main gripe for these Israel-haters is that Ahava’s products “come from stolen Palestinian natural resources in the Occupied Territory of the Palestinian West Bank, and are produced in the illegal settlement of Mitzpe Shalem. Don’t let the ‘Made in Israel’ sticker fool you—when you buy Ahava products you help finance the destruction of hope for a peaceful and just future for both Israelis and Palestinians”. Well, we know that for them “peaceful and just” means the ending of the Jewish state. But all this talk of illegality and mislabeling is a hoax. 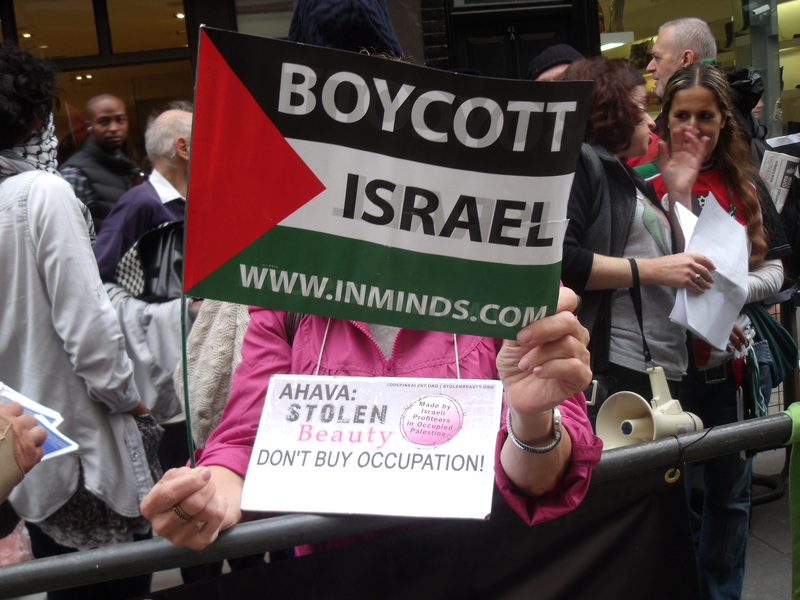 If you attend the Ahava protests you can view the many “Boycott Israel” signs and hear the constant calls for the destruction of the Jewish state. The protest is not about Ahava at all. However, when the activists get to court they have very able solicitors who will expertly argue the law for ends to which Parliament did not intend. They will argue that being on the West Bank Mitzpe Shalom is illegal and so as Ahava was not engaging in lawful activity when the activists invaded the shop the activists were not committing a trespass. 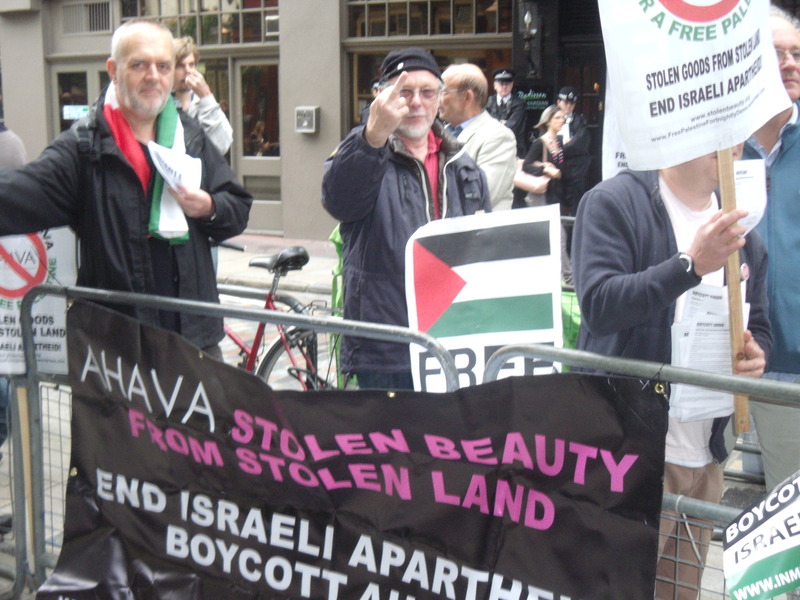 They are likely to be acquitted again and activists will continue to attack Ahava. 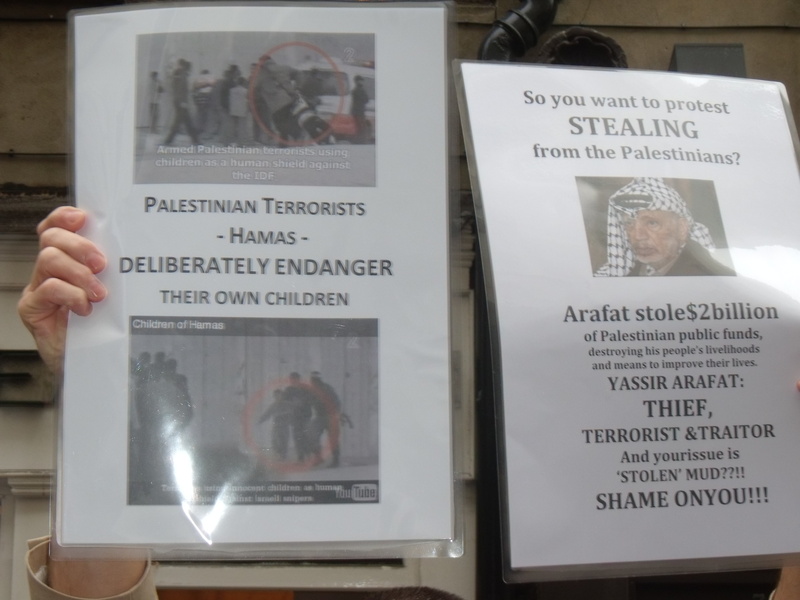 Intimidated Ahava staff will continue to see their photos put up on extremist websites. But both Mitzpe Shalom and the product labeling are legal. It is not the duty of a local magistrate to decide the legal status of Mizpe Shalom. And as Ahava is an Israeli company and the Dead Sea is also in Israel the product labels are not a misrepresentation. These are simple arguments that Ahava can make with the help of able, albeit expensive, legal representation. But Ahava should not even need to make this case as it is being targeted solely because it is Israeli. Britain should follow the French line and introduce the offence of incitement to discrimination, hatred or violence against a group of people on account of their belonging to the Israeli nation. A French anti-Israel activist was successfully prosecuted recently for damaging Israeli product packaging in a French supermarket. Other prosections are due to follow. This is being supported by Bureau National de Vigilance Contre l’Antisemitisme. 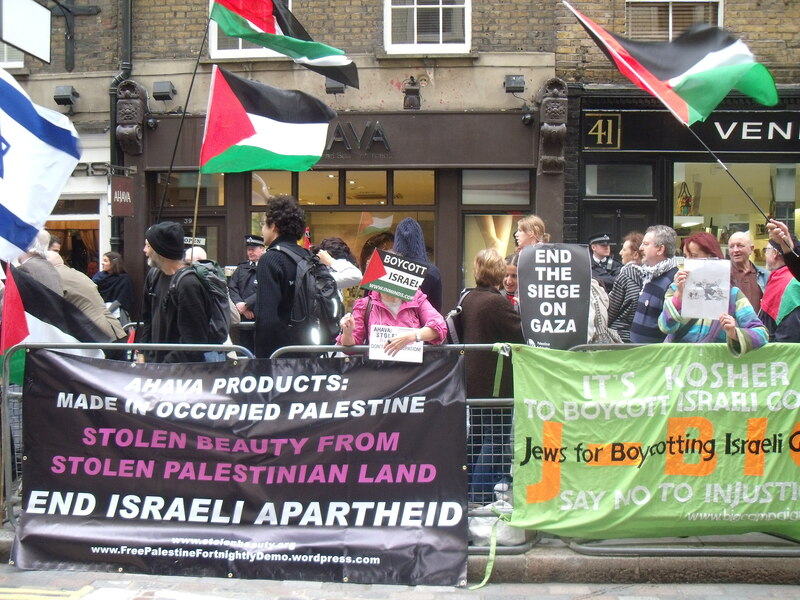 So come to the Ahava Buycott, arranged by the Zionist Federation on 20th and 21st November, where you will receive a 10% discount on all Ahava products and treatments and where you can stick two fingers up to the anti-Israel protesters. 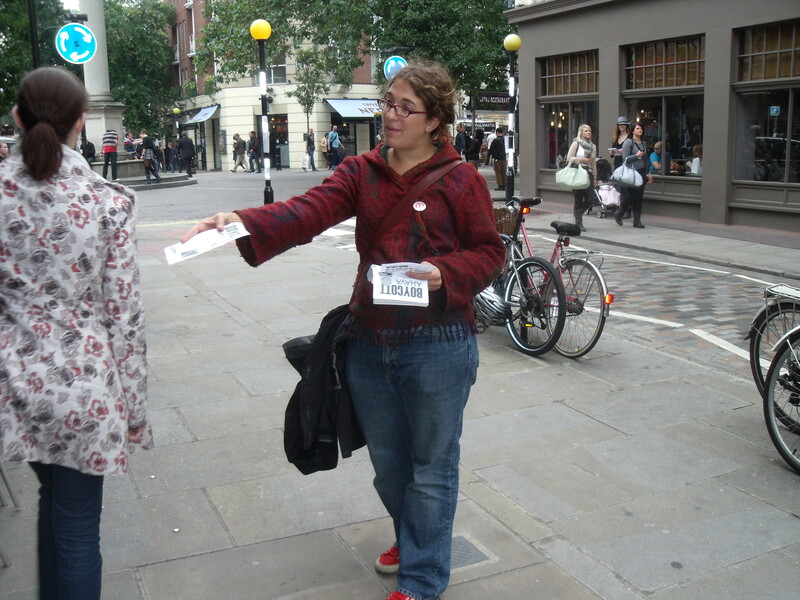 The address is Ahava, 39 Monmouth Street, Covent Garden (near Leicester Square tube). More importantly start lobbying your MPs for new legislation to protect Israeli products and businesses from being targeted solely because they are Israeli.